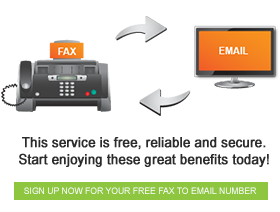 If you are still undecided as to whether you should send a fax online, consider the following. The internet fax has revolutionised the way the world communicates. More and more companies and private consumers are registering for free fax to email accounts, and taking their fax machines with them on the go. Whereas in the past you had to be physically present with your fax machine to send and receive messages using your fax number, today you can take your fax with you wherever you have access to the internet. It also means you can fax online whether you are on a plane, on the road or in the boardroom. These are only a few of the reasons why so many people are turning to sending and receiving a fax online. In the not so distant past, if you moved premises or offices you likely had to get a new fax number. It would be a pain to inform your network of your new number and also an expense to print new business cards and office stationery. With your fax to email number, you can keep that fax number for life. This means that even if you move cities or countries, you never have to change your fax number again. Deploy this powerful technology in your business today, and start saving money and enjoying greater productivity in your daily life and your business operations.